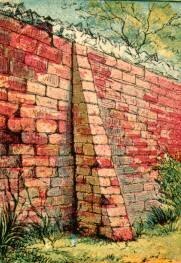 Public domain drawing of a red brick garden wall. We see a tree peaking out over the top of the wall and some grass growing on the outside. What wonders could be hiding behind these bricks? Could it be a formal English garden or another field of grass? Either way, the mystery of what lies behind the garden wall just adds to the fun with this copyright free image.